Though still really an undiscovered area outside of its borders the metal scene in Russia has a wealth of diverse and exiting bands that are slowly coming to light. One of the best comes in the powerful and impressive shape of blackened death metallers Shturm. They have just released their new album Karmaruna, an album that rages and rampages with a defined craft and refined thought. Having strongly enjoyed the album and intrigued to find out more about the band we had the pleasure of having twin guitarists/vocalists Adar and Omut from the band tell us more about Shturm and their album. 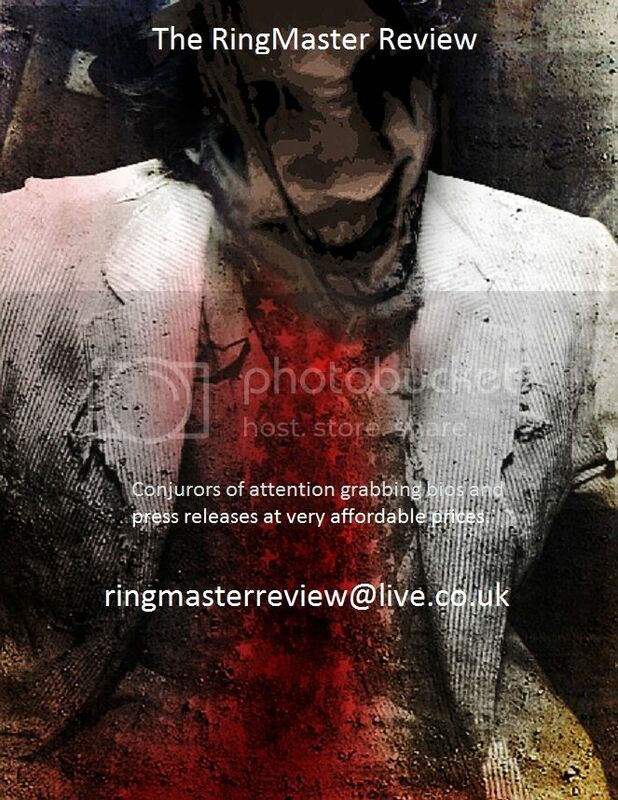 Hello and welcome to The Ringmaster Review, many thanks for talking to us. Would you first introduce the band and its members? When and how did the band first start? Adar: The group “Shturm” has appeared early in 2003. I and Sinner (bass, vocal) had organized it. At that time we were playing “war black metal” which can be heard on demo “Shape Of Chaos”. A year later the debut album “Fresh Christian Meat” had been recorded. It wasn’t only a black metal album, there was much more death metal. In 2009 label FONO Ltd. released our second album “Kalahia”. It was a blackened death work. Our image was reflecting the influence of black metal. What were the influences that led you to getting into making music and those that inspire you now? Adar: First we were influenced by such groups as Marduk, Immortal, Hipocrisy. Later we couldn’t avoid the influence of such monsters as Nile and Behemoth. Now the influence of these bands is very low. Listening to our album “Karmaruna” everyone can notice there the influence of different groups. So it’s difficult to say exactly who has influenced us during its creation. Your music has evolved deeply between your demo Shape of Chaos and debut album Fresh Christian Meat in 2004 and your excellent new album Karmaruna. How would you describe the change and maturity that has emerged? Adar: Really, I don’t know how to answer this question. As the years roll by everything turns out of itself. The childish maximalism concerning the views about life, music and fashion disappears. The music horizons broaden and you want to compose more interesting, distinctive music. Hereby “Karmaruna” appeared. The symbiosis of styles and views about life. We couldn’t allow us to make such a bold album before but now the time has come to break musical ranks and to experiment. You started out as a brutal black metal based band really originally as you said earlier, what was the thought behind the band at the time? Adar: That’s right. At that time we were 17 and we were only interested in protest against society, religion (especially Christianity), foundations, all these fops listening sugary pop music. We were like a bundle of nerves, drinking a lot, haggling. All this was reflected in our music – fast, raw, aggressive. It was a true black metal concerning all: views about life, texts, behaviour, attitude to people. We hated those who differed from us and we thought we were the strongest. We even had a song “Overpeople” which speaks for itself. It seems that when you Omut, joined the band and struck up a strong understanding and combination with Adar that things really began for the band and the new defined shape and direction to your sound. Is that how it was? Omut: After my appearance in the band much has changed as compared with previous course of things. But changes weren’t revolutionary. I and Adar, we were developing in the direction which was interesting for us, we were creating “Shturm” and we continue to do it. I think changes were gradual and logical. So the change as much simply a natural evolution of the music as it was down to this reassessing of things then? Omut: We always try to generate some unexpected, unpredictable decisions within the scope of our musical and lyrical ideas. That’s why the development of the band and of all that connected with it can be considered as planned (because all is often carefully planned) and spontaneous (because musical ideas for a new material are a great surprise even for us). As mentioned Shturm started out as a black metal band and has evolved through death metal to an even more brutal form though without losing your skilled intricacies and creativity. Have you found you have lost a few fans from the evolution though obviously gained a great many more? Adar: Oh, yes! Having broken through the ranks of death-black metal we have been subjected to criticism by our old fans. We were reproached for being pop and fashion oriented. But we don’t anger as it’s not true and we prove at our concerts that we are metal group as before but now we are not interested in playing only within the frames of several styles. What was the metal scene like in Russia over the first few years and did it help or hinder your progress? Omut: Metal scene of extreme genres in Russia has always been not impressive especially during the times of the formation of our group. It can be explained by the legacy of ban on this music made in The Soviet Union. While all the world was developing in the sphere of heavy music we had a sever ban on it in our motherland. At the early 2000 extreme metal scene represented an embryo under the influence of impressive bands from foreign countries. All this had a great influence on the lack of colouring and originality of Russian heavy metal. All the same we still loved such groups as Drama and Ragor. Russian heavy metal always makes us glad – Aria, Black Coffee, Master, Legion. We love this music and surely it has influenced on us. It seems now that music from your homeland and surrounding countries is finding a wider market and attention, is that the case? Omut: Of course, today there are more interesting Russian bands of different styles within the ranks of metal. Some of them are famous and needed abroad and it makes us glad. You have had a few line-up changes over the years, how does that affect a band when it happens? Adar: Line-up changes are always disagreeable. It turned out so that people have never left “Shturm” voluntary. We must dismiss them because of their futile approach to the work or we couldn’t simply find the common language. New people bring changes which are almost always good. I hope “Shturm” will have a stable, solid membership ready to compose for life and to do all for the band development. You have just released your excellent new album Karmaruna as we mentioned, and your most creative release to date. What are you most proud of about it? Omut: Maybe it’s a subjective judgment but we are proud of many traits and features of “Karmaruna”. The material was composed in unrepresentative atmosphere – we were discussing the finished riffs, ideas and drafts together and we were making the arrangements. That has had an influence on that the album turned out varied concerning style ranks. We are satisfied with both music and texts which gained our own specificity. Tell us about the album title. Omut: This is a symbiosis of two words that we wanted to call our next two albums after “Kalagia” – “Karma” and “Runa”. With the lapse of time we decided not to be in a hurry to release the double album and we created the material for “Karmaruna”. Karma is the law of cause and effect in which Buddhists trust. Runa in our interpretation is a sign, display. So, “Karmaruna” is this is how the fate or the karma of a being shows up in the world. In the form of rune signs can be recognized in trees, rain, love, war. According to the law of Karma the seeds of our past actions germinate in our current life and form it. So, as we understand it “Karmaruna” is the life, all around. What does it offer that those still unaware of your music will find hard to resist? How long has Karmaruna been in the making? Adar: It took about half a year to compose the material for “Karmaruna”. It took much time to try different arrangements, riffs and words but it’s worth the effort. Did the album come out exactly how you imagined it before going into the studio or did it change during the recording process to surprise you? Adar: Coming at the studio we had a strict plan of actions, almost all the arrangements were recorded on demo that’s why we needed only to record it with better sound quality. So, there were few changes during the recording and all passed as we had planned it. But experimented recording the vocal and it turned out quite different from our plans. How does the songwriting happen within the band? Omut: The songs for “Kalagin” were composed discretely by Adar and me. After that they were united in album playlist with few changes. It was a different thing with “Karmaruna” the material was composed by Adar and me but it weren’t finished songs. Raw material was sifted through and saturated with unexpected arrangements by me, Petreno and Adar. Drums and arrangements (and some riffs) of Petreno who took a very active part in composition enriched a lot the sounding of the album. Your songs and lyrics are often related to and refer too, quoting from your bio, “…the atmosphere of ethnic music, the heritage of Maya and the nations of Oceania, bearing the wisdom and grandeur of the old ones…” Can you elaborate on this? Omut: This characteristic can be applied partially only to the material of “Kalagia”. The texts for this album represents our interpretations of legends, traditions and mystic cults of “Buddhist” Tibet. On the text side “Karmaruna” became more wide – most of songs speak not about something far and mystic (as before) but about something vital and close to each person. The base is our modest reasoning on the basis of the Buddhist philosophy. Besides the album reveals the themes of patriotism, our private feelings about everyday life. What is it about the subject and themes that connect with you the most? Omut: All about what we sing excite us to a considerable degree. The past of our nation, our private feelings, reasoning about happiness and suffering based on the covenant of Buddhist teachers. All this is important and impressive for us. You have a reputation for powerful and memorable live shows I am told, this is always a special event you like to bring to your fans? Omut: We try to push ourselves to the limit giving concerts. This is our way to express live our feelings and ideas born during our albums work. We try to make our show energetic and emotional. We had a different image before. Now we are disposed to the individuality and hope to surprise more those who give us much attention at out concerts. Have you gigs lined-up to promote the album? Adar: Yes, we plan concerts to promote “Karmaruna”. For the present it will be the concerts in Russia and CIS, but we hope to travel farther. What is next for Shturm? Adar: I think the future will be more interesting for us and for those who appreciate our previous work. Until we live “Shturm” lives. There will be new songs, concerts, clips. I hope we’ll visit England with concerts. Of course it’s not easy but it’s worth doing! We plan the release of a new clip for one of the songs of “Karmaruna”, the recording of EP which will contain one new song and some interesting compositions known by metalheads and connoisseurs of early “Shturm”. And of course the new album which creation has already begun. Thank you for taking time to talk with us, very much appreciated. Would you like to end with some words for your ever growing army of fans? Follow “Shturm”, everything is just beginning. The most interesting is ahead! Though it was released the tail end of last year the recently brought to our attention EP Last Rites from UK metallers Cambion is just so good that a sharing was a must. Without breaking down boundaries or driving into new areas Last Rites is a full and muscular pleasure that brings an extra fresh breath into an already lively flurry of emerging UK metal bands. Cambion have something extra though not something which can be pinned down but their music just rips through the senses to invigorate, light up, and bring them wonderfully to the boil. They just bring a maelstrom of raging aggression, skilful technical accomplishment, and simply heart lifting uncompromising metal. Formed in 2009, the Devonshire band openly state their influences and start their sound with seeds of the likes of Fear Factory, Meshuggah, and Divine Heresy. There is much more to their sound but you can hear those inspirations within the five songs that make up Last Rites. The year after forming saw the band on tour with Fozzy and in 2011 Cambion played a return performance at Wizzfest in Belgium alongside Blaze Bayley. That year also saw the release of their second EP City of Ember as well as new members, bassist Colin Beale and rhythm guitarist Liam Neary joining drummer Frank Dennis and lead guitarist/vocalist Elliott Alderman-broom. With the band in their time also sharing stages with the likes of The Defiled, Malefice, Fury UK, and Beholder, they have become as shown by the EP a tight and formidable band which deserves being placed at the fore of the new metal blood coming through. The EP opens with the muscular rampaging Death March. The track rifles the ear from the start with threatening riffs, concise guitar asides, and growling venomous vocals. The song is a towering aggressive animal which breaks down any resistance with its deliberate and intense drive. Midway the song steps back in pace as a wonderful solo lights up the darkened corners of the song but it is not long before the insurgent rhythms and barracking riffs resume control. The song is a strong start to the release if not the most remarkable but it is impossible not to be swept up in its overpowering force. The following Jester steps up a gear adding a fine groove metal vein to the assaulting riffs and intensity. It is with the excellent clean vocals though alongside the sharp melodic play that one is openly shown just how good this band really is. That previously mentioned undefined essence a sure presence as the track wraps its intrusive manipulative groove and touches around the ear tightly. There is a mix of Malefice and Periphery that come to mind as the track plays though just strong spices to their flavours. It is with Quantum Concept and Salem that the release really ignites all the inner sparks. Both tracks are immense and as satisfying and intriguing as they are intense and consumptive. The first brings its Meshuggah incited elements to the forth to puncture and persistently jab the senses with tight and eager riffs, whilst alongside there are crystalline melodic strikes which mesmerise. The rhythms from Dennis are immense showing him , as do all the tracks, what a masterful and inventive drummer he is, the driving force for the songs but with an intelligence and imaginative flair. Salem is the best song on the release though a close call between them all. It stomps and grooves with a devilment that rides the intrusive spikes of sound which the track pitches into the senses. It is like being plugged into the mains listening to it as it forces a hyperactive response to its violations and a mesmerised addiction to its caressing melodic and harmonious play and vocals. The closing Virus Pt.2 The Infection is a bristling pulsating metal mix offering a Fear Factory industrial tone and a scraping Static X electric intensity. As it stirs up the senses the song adds a melodic progressive metal side step which shifts the song into a warmer feel before returning to rupture the senses once more with direct and manipulative strikes. Last Rites is excellent , simple as that. It not only hits the spot and gets the blood flowing in a torrent it declares Cambion as one of the most impressive emerging UK metal bands and one to watch very closely. A Constant Struggle the debut album from US rock band S.I.Q., is one of the most intriguing releases to appear in recent months. It is a stirring and thoroughly enjoyable release which ignites the senses and emotions whilst provoking thoughts and questions. If you are looking for a release to bring you striking rock sounds, adventurous invention, and satisfying slices of metal as well as leaving you with food for thought than A Constant Struggle is the release that you should check out. Formed in the Summer of 2009, the Charlotte N. Carolina band took no time in grabbing attention with their imaginative progressive sound and were soon playing the top local venues, winning two battle-of-the-bands events, as well as making their first demo. Line-up changes ended in the current quintet of founders, vocalist Ashton Johnston, guitarists James Nelson and Philip Rich, bassist Cole Millward, being joined by drummer Paul Wood. Together the five piece entered Knothole studios at the twilight end of 2011 to record A Constant Struggle, bringing all their very individual and distinctive talent and ideas together to create a fully collaborative album which is infectious, captivating and provocative. S.I.Q. (Society in Question) are a band which obviously from the evidence of the album puts full thought into every aspect of the album from music, to lyrical content and the presence that fuels it. The songs within the album feels closely linked, part of a journey or theme though it is not openly obvious or it is simply being missed. It might just be the passion and heart of the band pouring through into each track but there is a definite bond between the songs which is as intriguing as the sounds and ideas within them. The opening track Riddle Of You gives an instant indication of the progressive nature of the release with its initial bubbling melodic beckoning towards the ear. The song soon expands into a striking creature as the track slowly rises to its feet. Muscular riffs start flexing and leading the cause as the fine vocals of Johnston starts unveiling the heart of the song. The riffs continue to niggle and badger the ear as the melodic invention infuses within the powerful intensity. Lit up by the magnetic pull of the melodic enterprise that pours from the song as it progresses, the senses are captivated and eager to drive further into the album though the lengthy ten minute opener ensures the wait is very satisfying and the following Slightly Out of Breath ensuring it was worthy while. The second song litters the ear with a blistering insistent shower of metallic artillery of riffs, picking and spotting the senses like hailstones until a lull leads into a feisty and formidable display of towering riffs and sharp melodic manipulations. As the track paces and slightly intimidates the senses the rhythms of Wood announce fully their strong and inventive prowess, the drummer bringing an adventurous spine to the songs which never breaks lose from his intelligent and skilful control. The progressive Dream Theater like Stasis and the acoustically driven ballad Silver Lining keep our attention and enjoyment firmly in the grasp of the band though both tracks do not quite spark the reactions the previous duo of tracks inspired. The album takes a defined rise though from Nightmare Lullaby on to its conclusion revealing further proof that S.I.Q. are a band that is destined for great things. Few of their songs make fleeting appearances but Nightmare Lullaby takes us on a ten minute plus journey of warm melodies and exhilarating songwriting. The track is irresistible, an invention offering evocative guitars and melodic interplay alongside harmonies which excite and touch the emotions in the way seventies band Horslips were skilled at. Arguably the track is a little overlong but there is never a moment it out stays it’s welcome. The losing trio of tracks under the umbrella title of ‘Till Life Do Us Part continue the deep enjoyment. Parallel Worlds starts the trilogy bringing more of the unique and impressive sounds already graining the album whilst the closing Until the End takes one on a thirteen minute blissful journey of pure progressive pleasure, but it is the linking middle hypnotic instrumental Alive or Dead which hits the loftiest heights. It is immense and the declaration of this being a band that can induce rapture by music alone. A Constant Struggle was an unexpected and deeply rewarding introduction to S.I.Q., a band that surely is destined for great things. Their list of influences include the likes of Protest the Hero, Symphony X, Dream Theater, As I Lay Dying, Devin Townsend, Periphery, and Alice in Chains, if any of these make you rise up in eagerness you will love S.I.Q.